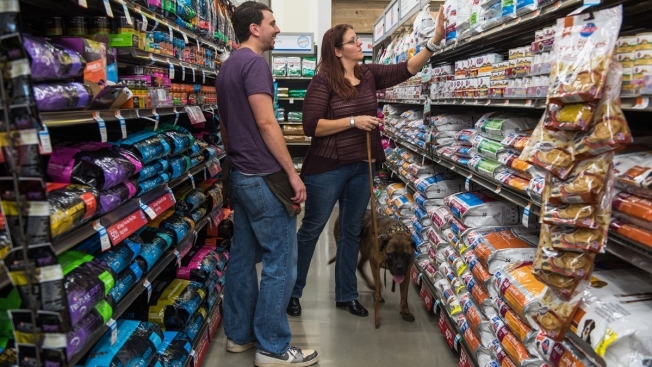 This Oct. 2, 2015, file photo shows a pet supply store employee help a customer with dog food in Clark, New Jersey. The FDA says dog food heavy in vegetable content can cause an enlarged heart in some breeds of dogs. The Food and Drug Administration is warning that dogs are developing an unusual condition that can cause an enlarged heart after being fed food based on peas, lentils or potatoes, NBC News reported. The condition, canine dilated cardiomyopathy, is turning up in breeds that don't usually get it, the FDA said, though it's not naming the breeds. Symptoms of DCM include lethargy, weight loss and sometimes a cough, and the condition may be fatal. Hearts enlarged because of DCM can struggle to work properly and may fail. "The FDA is investigating the potential link between DCM and these foods. We encourage pet owners and veterinarians to report DCM cases in dogs who are not predisposed to the disease," FDA Dr. Martine Hartogensis said in a statement.